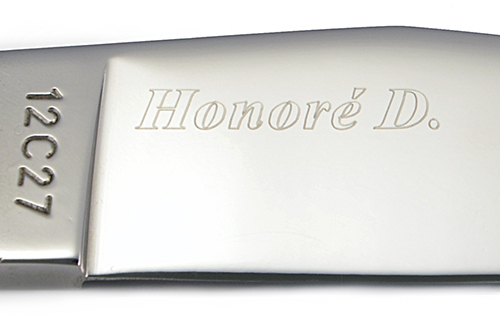 On each of our Laguiole knives, we propose to engrave your name and/or firstname on the blade. We use a pantograph with a diamond. It is the same technique as jewellers'. Diamond engraving is permanent (avoid all abrasive when cleaning your knife, it will scratch the blade). With the forged bee, you can have your initials or you name or surname hand-chiselled on the spring. This work is done before quenching and before any fitting. The delivery time is longer. Beware: this option is possible only for the Prestige range folding knives with massive spring and bee and all the Collection range knives. 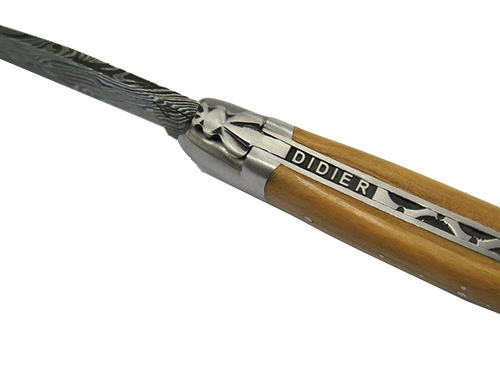 Firm logos engraving on the blades – please contact us.